Improve your PHP coding productivity with this guide to the powerful and popular CodeIgniter framework. This book is for developers who are new to CodeIgniter. Basic skills in PHP and MySQL are required, but only rudimentary object-oriented knowledge is required. 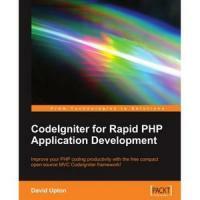 If you're looking for a better way to develop PHP applications, or want to find out more about the CodeIgniter framework as a viable option for one of your own projects, this book will help you. David Upton is a director of a specialized management consultancy company, based in London but working around the world. His clients include some of the world's largest companies. He is increasingly interested in web-enabling his work, and seeking to turn ideas into robust professional applications by the simplest and easiest route. He has so far written applications for two major companies in the UK. His other interests include simulation, on which he writes a weblog which takes up far too much of his time, and thinking.